Would you stick your head in here on the promise of a relaxing massage? Next time your curiosity is piqued by one of those street-corner calls of 'Fancy a massage?' just remember to bring along a can of WD-40, lest your would-be manipulator turn out to be more machine than masseuse. The likelihood of that happening is, admittedly, small but it is at least more than science fiction now that Japan's Waseda University has come up with a massage-giving robot. 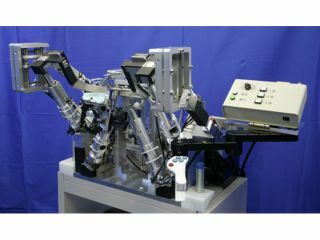 The WAO-1 robot was originally designed by Atsuo Takanishi to help in the rehabilitation of people with jaw-related medical conditions that required massage, but it soon became clear the machine was capable of a whole lot more. From next month WAO-1 will begin trials in which its golf-ball-like appendages will be rolling over the faces of volunteers in Tokyo in a bid to help them relax and feel better. The balls interact with half a dozen sensors in the robot's arms and are controlled by massage-simulating software. If approved by the Japanese government's dedicated robot-safety panel (really), WAO-1 is sure to appear in spa resorts and beauty parlours nationwide within a few years. Incidentally, don't get too excited and book a ticket to Tokyo after reading about the shampoo robot mentioned in the linked story - it's really just a glorified basin that has barely been seen in Japan. Our hardworking hairdressers are safe for now.